The mitochondrial encephalomyopathies are a diverse group of disorders characterized by defects in mitochondrial function. Because the mitochondrion is the only organelle in the cell, other than the nucleus, that contains its own DNA, inherited defects causing mitochondrial dysfunction can be due to mutations either in nuclear DNA (nDNA) or in mitochondrial DNA (mtDNA). Figure 1. 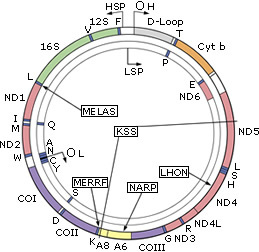 The Human Mitochondrial Genome: Human mtDNA encodes 13 polypeptides: 7 subunits - ND1, ND2, ND3, ND4, ND4L, ND5, and ND6 - of Complex I (NADH-Coenzyme Q oxidoreductase); 1 subunit - cytochrome b - of Complex III (CoQ-cytochrome c oxidoreductase), 3 subunits - COX I, COX II, and COX III - of Complex IV (cytochrome c oxidase, or COX), and 2 subunits - ATPase 6 and ATPase 8 - of Complex V (ATP synthase). It also encodes 2 rRNAs (in green) and 22 tRNAs (in blue). The human mitochondrial genome is a 16,569-bp (base pair) circle of double-stranded DNA. It contains 37 genes, which specify 2 ribosomal RNAs (rRNAs), 22 transfer RNAs (tRNAs), and 13 polypeptides (Figure 1). All 13 polypeptides encoded by mtDNA are components of the respiratory chain/oxidative phosphorylation system and include 7 subunits of Complex I (NADH-Coenzyme Q oxidoreductase), 1 subunit of Complex III (CoQ-cytochrome c oxidoreductase), 3 subunits of Complex IV (cytochrome c oxidase) and 2 subunits of Complex V (ATP synthase). Each of these complexes also contains subunits encoded by nuclear genes, which are imported from the cytoplasm and assembled, together with the mtDNA-encoded subunits, into the respective holoenzymes, which are embedded in the mitochondrial inner membrane (Figure 2). Complex II (succinate dehydrogenase-CoQ oxidoreductase) contains only nDNA-encoded subunits. Figure 2. The Mitochondrial Respirato(succinate dehydrogenase-CoQ oxidoreductase), of which succinate dehydrogenase (SDH) is a component, is encoded entirely by nuclear genes. There are several distinctive features of mtDNA that are relevant to the understanding of mtDNA-related diseases. At fertilization, all mitochondria are contributed by the oocyte; thus mtDNA is inherited only from the mother. Therefore, most mtDNA point mutations are maternally inherited: a woman carrying an mtDNA point mutation will transmit it to all her children, males as well as females, but only the daughters will transmit it to their progeny. However, it is important to note that, while mtDNA itself is transmitted by the mother, disorders of mtDNA are not always inherited maternally. For example, large-scale single deletions in mtDNA are often sporadic, as are many point mutations in the cytochrome b gene. Multiple deletions and mtDNA depletion are a result of mutations in nuclear genes that affect the integrity or quantity of mtDNA; as such, they are transmitted as autosomal recessive or autosomal dominant traits. In contrast to nuclear genes, each consisting of one maternal and one paternal allele, there are hundreds or even thousands of copies of mtDNA in every cell. Thus, when there is a deleterious mutation, both normal and mutated mtDNAs may coexist within a patient's tissues, a condition known as heteroplasmy. A critical number of mutated mtDNAs must be present before tissue dysfunction and clinical signs become apparent, the so-called threshold effect. Tissues with high requirements for oxidative energy metabolism, such as muscle, heart, eye, and brain, have relatively low thresholds and are particularly vulnerable to mtDNA mutations. At cell division, the proportion of mutant mtDNAs in daughter cells can shift, a phenomenon termed mitotic segregation. If and when the pathogenic threshold for a particular tissue is exceeded, the phenotype can change. Thus, in a patient who is heteroplasmic for a pathogenic mutation, the clinical phenotype can change over the course of time. Beginning in 1988, an ever-increasing number of mitochondrial diseases with distinct clinical phenotypes has been associated with mutations in mtDNA, almost all of which result in neurological or neuromuscular disorders. These errors fall into three major classes: (1) large-scale rearrangements of mtDNA; (2) depletion of mtDNA; (3) point mutations in mtDNA. Large-scale single deletions of mtDNA are associated with three major clinical conditions: Kearns-Sayre syndrome (KSS), progressive external ophthalmoplegia (PEO), and Pearson syndrome (PS). Although dozens of different deletions have been described, each patient harbors only a single type of deletion (Figure 3A), and the proportion of deleted genomes varies among different patients and in different tissues from the same patient (heteroplasmy). Most patients reported with deletions in mtDNA have been sporadic; mothers of affected individuals and children of affected women are clinically normal and, when tested, had no detectable deletions. This suggested that deletions arise de novo early in embryogenesis or in the ovum. However, there have been a few reports of deletions that appear to have been transmitted maternally. Thus, one needs to be cautious when counseling. Some patients harbor more complex mtDNA re-arrangements, and duplications of mtDNA, both sporadic and maternally inherited, (the latter often associated with diabetes and deafness) have been reported. In addition, Mendelian-inherited disorders have been described in which affected family members harbor large quantities of multiple species of deletions of mtDNA in their tissues (Figure 3B), which are apparently generated during the life-span of the patient. These disorders are a result of mutations in nuclear genes that either facilitate an intrinsic propensity of mtDNA to undergo rearrangements or impair recognition and elimination of spontaneously occurring rearrangements. Single or multiple deletions in mtDNA are detected by Southern blot analysis and are best demonstrated by testing DNA isolated from muscle, since, in most patients, deletions are difficult to detect in DNA isolated from blood. To perform Southern analysis, total DNA is isolated, digested with restriction enzymes, separated on an agarose gel, transferred to a membrane (nitrocellulose or nylon), and hybridized to a labeled mtDNA probe (which will hybridize only to the mtDNA). The bands are detected by autoradiography, and their size(s) indicate whether only the normal-sized mtDNA (16.6 kb) is present or whether there is also a population of a smaller mtDNA, indicating a deletion. Figure 3A illustrates two patients, one having a hybridizing band at 12.2 kb i.e. 4.4 kb deleted) and another with a band at 10.3 kb i.e. 6.3 kb deleted). A band that is larger than 16.6kb would indicate a duplicated species. In patients with multiple deletions, Southern blots of DNA isolated from muscle show multiple bands representing species of mtDNA molecules harboring deletions of different sizes (Figure 3B). Figure 3. Southern blot hybridization analysis: Shown are analysis to detect "single" deletions (A), "multiple" deletions (B), and mtDNA depletions (C). P, P1, P2=patients; c=controls. 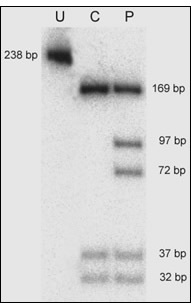 For Southern blot analysis, several issues are important to consider. The first is the tissue used for testing. As explained above, deletions may only be detectable in DNA isolated from muscle. Another consideration is which restriction enzymes to use to digest the DNA. One usually uses at least one enzyme that has only a single cutting site in mtDNA, such as Pvu II, BamHI, or EagI, so that the circle is linearized. MtDNA depletion syndromes encompass a clinically heterogeneous group of disorders characterized by severe reduction in mtDNA copy number. Primary mtDNA depletion is inherited as an autosomal recessive trait and has been associated with mutations in nuclear encoded genes responsible for mtDNA synthesis or maintenance of nucleotide pools. MtDNA depletion may affect single organs, typically muscle or liver, or multiple tissues. The mtDNA content can be measured by Southern blot analysis by taking the ratio of signal intensity of mtDNA to the signal intensity of a nuclear gene, usually the 18S rRNA gene (Figure 3C). However, this method has several inherent disadvantages, including a relatively long turnaround time, use of 32P radio-labeled probe, and low accuracy (semi-quantitative). In contrast, quantitative real-time PCR offers several advantages; it is fast (less than 2 h), uses environmentally safe reagents, and has high accuracy. The amount of mtDNA relative to the amount of reference is calculated from their respective threshold cycles. Since the mtDNA content varies among different tissues and at different ages, a series of age matched normal tissue controls are always included when mtDNA copy number is studied. More than 100 pathogenic mtDNA point mutations have been documented and new ones are still being described. They are located in all regions of the genome, about two-thirds of them in tRNA genes and the rest in the polypeptide-coding genes, with only a few in rRNA genes. Some of these mutations have been reported in only one or a few families, while others appear to be more common. Two of the more common mtDNA point mutations in tRNA genes are associated with MERRF (myoclonus epilepsy and ragged red fibers) and MELAS (mitochondrial encephalomyopathy, lactic acidosis and stroke-like episodes) syndromes. The first point mutation in a tRNA gene to be reported was the A-to-G transition at the nucleotide (nt) position 8344 (A8344G) in patients with MERRF. This mutation is present in approximately 90% of patients with MERRF. The A-to-G transition at nt-3243 (A3243G) is the most frequently-encountered mtDNA point mutation and it is associated with a spectrum of clinical presentations. This was originally described in patients with MELAS and in their maternal relatives who were often oligosymptomatic, presenting with diabetes, short stature, migraine headaches, hearing loss, or other features, either alone or in various combinations. In addition, this same mutation has been described in patients with maternally inherited PEO as well as those with diabetes and deafness. Infantile presentation, while infrequent, has also been reported. Pathogenic mutations in rRNA genes are rare. The most common one is in the 12S rRNA gene (A1555G), associated with aminoglycoside-induced deafness or non-syndromic hearing loss. The more common mutations in protein-coding genes are associated with two disorders: LHON (Leber's hereditary optic neuropathy) and NARP/ MILS (neuropathy, ataxia and retinitis pigmentosa/maternally-inherited Leigh syndrome). The G-to-A transition at nt-11778 in patients with LHON, a disorder characterized by acute or subacute onset of bilateral visual loss in young adults, was the first point mutation in mtDNA to be reported. LHON is associated with three primary mutations in genes encoding subunits of complex I of the respiratory chain: G3460A, G11778A, and T14484C, These mutations are usually homoplasmic. A T-to-G mutation at nt-8993 (T8993G) in the mtDNA gene encoding ATPase 6 was initially described in patients with a maternally-inherited multisystem disorder characterized by neuropathy, ataxia, and retinitis pigmentosa (NARP). A family was subsequently reported in which an adult family member had the NARP syndrome and three children had maternally-inherited Leigh syndrome (MILS). This association has subsequently been confirmed and it is now established that, for this particular mutation, there is a good correlation between the percentage of mutant genomes (i.e. degree of heteroplasmy) and the severity of the clinical phenotype: patients with low levels of mutation are unaffected or have only mild symptoms, those with intermediate levels present with NARP, whereas those with very high levels (more than 95%) of mutation present with MILS. In addition to the T-to-G mutation, patients with a T-to-C substitution at the same position (T8993C) have alsobeen reported and have milder clinical manifestations. Some patients with exercise intolerance often harbor mutations in protein coding genes, causing defects in complex I, complex III, or complex IV. These patients are almost always sporadic, with no evidence of maternal transmission. Additionally, in most cases, these mutations are present only in muscle and are not detectable in blood or fibroblasts. It is believed that these mutations are somatic - that is, spontaneous events that occur in muscle and do not affect germ line cells. It has become common practice to look for mtDNA point mutations in DNA isolated from blood. However, in certain cases, muscle DNA provides more secure molecular diagnoses and, in others, it is essential for the diagnosis. When looking for point mutations in tRNA genes, blood is usually an adequate source of tissue. However, certain point mutations in structural genes are not present in blood. Other mutations, including the most common one at position 3243 (the A3243G "MELAS" mutation) may have a low proportion of mutant genomes in blood, especially in maternal relatives of patients. Other accessible tissues have higher mutation loads than blood and are useful for diagnosis, including urine and cheek mucosa. Cells from urinary sediment are obtained by collecting urine (about 10 ml, preferably from first morning void). Cells from cheek mucosa are obtained by scraping the inside of the mouth with a cotton swab, dipping the swab in 3-5 ml of saline and obtaining a pellet by low speed centrifugation. Known point mutations in mtDNA are screened for by amplifying an appropriate fragment of mtDNA by PCR, digesting with a diagnostic restriction enzyme, and analyzing the fragment sizes on a gel. This involves the following steps: (1) oligonucleotide primers are designed to allow amplification of mtDNA encompassing the mutated site; (2) appropriate mtDNA fragments are amplified by PCR in the presence of 32P-dATP; (3) PCR products are digested with a restriction enzyme that cleaves normal versus mutated sequences differentially (i.e., restriction fragment length polymorphism, or RFLP); (4) digestion products are electrophoresed through nondenaturing polyacrylamide gels; and (5) fragment sizes are detected by autoradiography. PCR/RFLP analysis for the A3243G mutation is illustrated in Figure 4. Figure 4. PCR/RFLP analysis for the MELAS A3243G Mutation. A 238-base pair PCR product is digested with the restriction endonuclease HaeIII. The A-to-G mutation at position 3243 creates an additional, diagnostic restriction site for HaeIII, so that a 169-bp fragment that is present in normal DNA is cleaved into a 97-bp and a 72-bp fragment. Thus, normal DNA has fragments of 169, 37, and 32 bp, whereas mutant DNA has fragments of 169, 97, 72, 37 and 32 bp. U, undigested; C, control; P, patient.